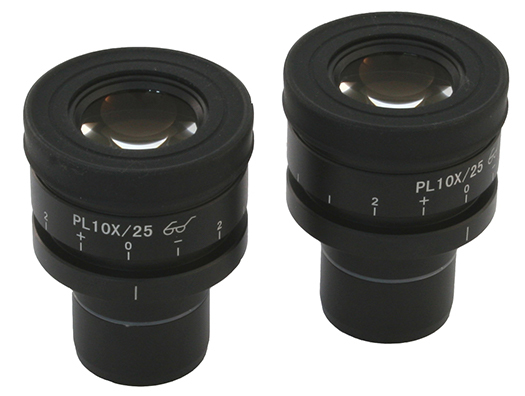 Many upright microscopes have focusing eyepieces. 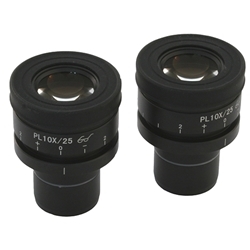 These eyepieces can be adjusted by each microscope operator to ensure that the image is crisp and clear for their eyes. The focusing eyepieces adjust for any differences in vision between an individual person's two eyes. Properly setting up the focusing eyepieces takes a few simple steps and should be performed by each user, since the settings will vary from one person to the next. Start by adjusting the interpupillary distance on the microscope so that both the left and right field of view become one when looking through the eyepieces. Set the diopter adjustment on both eyepieces to the "0" position. Start with the lowest magnification objective (4x) and focus the image by using just one eye, whichever you are most comfortable with. Use both the coarse and fine focus to get a crisp image. Close the eye you just used and look through the other eyepiece with the other eye. Don't touch the focus knobs, but rather adjust the diopter on the eyepiece if the image is out of focus at all. Move up to the highest magnification objective. Repeat the procedure using the highest objective lens. This final adjustment is the one you will want to take a note of and set the microscope to when using it each time. The image should remain in focus as you move between magnification adjustments on the microscope. The microscope is now parfocalled. If you have questions regarding microscope focusing eyepieces or how to parfocal your microscope, contact Microscope World and we will be happy to help.